This weekend marks the 40th Ryder Cup Competition. Taking place in Scotland, this golf competition between Europe the United States happens every 2 years. But do you know where the Ryder Cup got its name? The idea for the competition started in 1920 when Golf Illustrator suggested that a team of professional American Golfers play in the British Open in 1921. This started what would become a popular sports rivalry with more and more Americans participating in the British Open each year. In 1926 an English business man, Samuel Ryder announced he would donate a cup for an International competition. 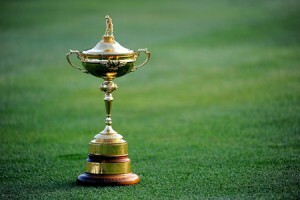 Starting what would become golf’s most important and competitive team competition, The Ryder Cup. In 1927 A Ryder Cup “Deed of Trust” was drawn up formalizing the rules of the contest. The first 10 years the competition was only open to the US and Great Britain with the US dominating the game and winning the first 5 contests. (Quite different from the current threat of Britain’s hat trick win this year) The competition was put on hold during WWII and when it r resumed America continued it’s dominance in the competition leading to the inclusion of the rest of Europe in 1979. This change started much of the media and social hype that surround the Ryder Cup as we now know it with three teams: Team USA, Team Great Britain & Ireland, and Team Europe. The cup itself is made from gold standing at 17 in tall, 9 inch wide weighing 4 pounds! (1/8th the weight of the Stanley Cup) It is rumored that the figurine at the top if the cup is depicted to be Samuel Ryder’s good friend and golf instructor Abe Mitchell. The US Team has won 25 of the 39 tournaments, winning team members all receive a mini replica to take home. Let’s see if this weekend team USA can bring home win 26! This entry was posted in Uncategorized on September 26, 2014 by Spike's Trophies.